Super PACs supporting former Gov. 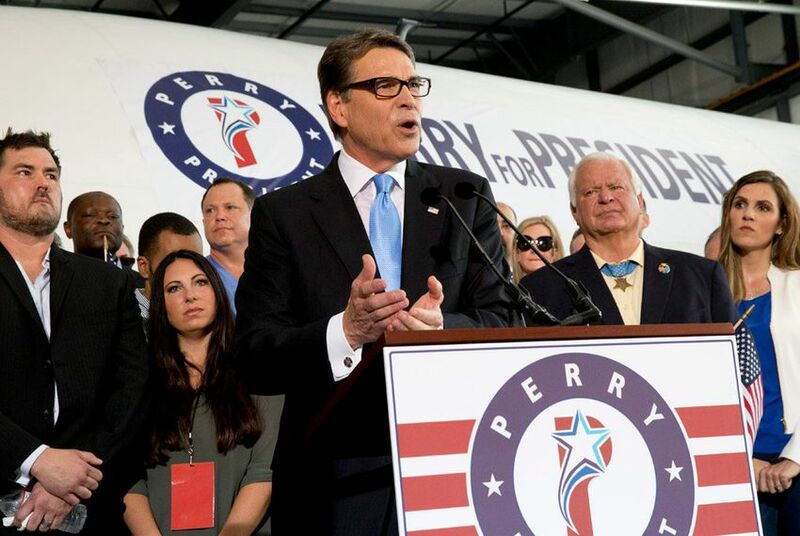 Rick Perry are hoping to boost his national profile by airing ads on cable TV. The groups are launching an effort geared toward securing him a spot in the GOP's first presidential debate next month. A trio of super PACs supporting former Gov. Rick Perry is launching a national TV ad campaign in hopes of securing him a spot in his party's first presidential debate next month. The groups, which recently announced they had raised nearly $17 million, are spending hundreds of thousands of dollars to go on the air on Fox News and other cable channels, according to spokesman Jordan Russell. He said the effort is meant to "help in the run up to the first debate," which is being held Aug. 6 in Ohio. To qualify for the event, a candidate must be in the top 10 of an average of the five most recent national surveys. Perry has been straddling the threshold in recent weeks, and on Tuesday, the RealClearPolitics national polling average showed him tied for ninth place with New Jersey Gov. Chris Christie. Airing ads on cable TV this early in the process is unusual for a presidential candidate, or any group backing one. But the effort by the super PACs is a reminder of how much the debate's eligibility requirements have changed the short-term dynamics of the GOP race, putting a premium on national exposure over grassroots support in the early-voting states. It will not be the first time that super PACs, which started with a group called the Opportunity and Freedom PAC, have sought to tout Perry on TV. They have already spent more than $900,000 promoting Perry on the airwaves in Iowa, a campaign that began the day after Perry made his 2016 bid official last month. For now, the super PACs do not appear strapped for cash to fund the TV time. They announced Friday they had raised $16.8 million, most of it from three wealthy backers. Perry's campaign, meanwhile, disclosed it had taken in $1.07 million, giving his supporters an overall haul of just under $18 million as of earlier this month. The New York Times first reported the super PACs were going on the air nationally.